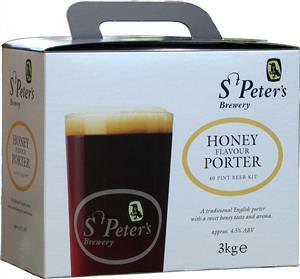 This kit is based on the bronze award winning recipe (the national honey show 2012) of the St Peter’s brewery Honey Porter. This 40 pint kit brews a rich and sweet porter with a final strength of approx. 4.5 % ABV. Enjoy the unique taste of St Peters beer brewed by your own fair hand. The newest St Peters kit to date.